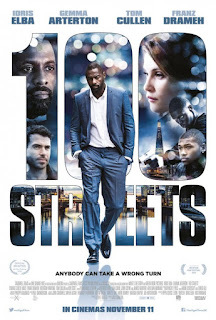 The multi-strand British drama 100 STREETS (alternatively titled A Hundred Streets), starring Idris Elba, has received some tepid reviews, but don't allow them to discourage you from seeing this nicely understated film. Based on a short film by the screenwriter, Leon Butler, it tells three very loosely linked stories about people living within a single square mile of London. Elba plays a former rugby star called Maximus Moore, whose wife, Emily (Gemma Arterton) has kicked him out because of his infidelities (apparently he was sleeping with the nanny). Emily, an actress who quit to raise her children, is having a romance with Jake (Tom Cullen), a photographer, while Max tries to win his way back to Emily and their children. Emily is torn between Jake, who is pushing for a fuller relationship, and her dashing estranged husband. Blocks away, a young black man named Kingsley (Franz Drameh), is involved with a criminal gang, but also displays a talent for composing and performing spoken-word poetry. He recently served some jail time, and gets “nicked” (arrested) in a brawl outside a bar. His worried mother kicks him out of their apartment after finding a gun in his dresser drawer. Sentenced to community service cleaning up a cemetery, Kingsley meets an old actor, Terence (Ken Stott), who is Emily's mentor. Terence takes an interest in the creative-minded young man and urges him to audition for Emily's theater group. A brighter future beckons, but Kingsley's gang associates exert a dangerous pull, complicating his efforts to leave the criminal life. The stories are very tenuously connected, and sometimes the linkages — as when Terence is randomly targeted by members of Kingsley's gang — are overly contrived. But I enjoyed the ways the film shows a spectrum of social classes, exploring the lives of the ordinary and the privileged. The least convincing story is that of the sports star, Max — Elba doesn't seem entirely comfortable in the part — but the playlet is not without interest. There are resonances, intentional or not, with the story of O.J and Nicole Simpson: famous, wealthy retired sports star, his beautiful Caucasian wife, his lovely biracial children, his avid cocaine use, jealousy and propensity for violence, which finds him in an armed standoff with police. Emily's difficulty leaving her husband, despite his terrible behavior, is made somewhat understandable by the fact that he's a loving father whom the children adore. A high level of writing and acting, and Jim O'Hanlon's sure direction elevate 100 STORIES from the soap-operatic premises of its stories. The film has a little in common with Barry Jenkins' recent Moonlight, in its focus on how living in a particular neighborhood can shape and define lives. “You can try to leave this life,” Kingsley says in one of his poems. “This life will never leave you.” Both films also offer rays of hope, a commodity much needed in our time. 3 1/2 out of 4 stars.